I've just come back from Panaga. It was a good race and I'm extremely happy with my performance compared to my Powerman results. My swim and run time shows an improvement from last year . 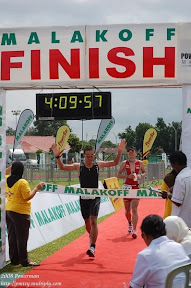 The cycle leg - due to the distance being shortened from 28km to 24km, I cannot compare my result with last year. At least for bike leg, My predictions was that I should be able to do it below 48mins. I guess not many read the notes or read thoroughly that was email to them or attend the briefing last night. Due to road closure and diversion in some part of Jalan Tengah, Seria, the distance was shortened from 28km to 24km and the number of laps was increased from 2 laps to 3 laps for Full triathlon and 2 laps for mini triathlon. Some athlete only did 2 laps instead of 3 laps, rugilah. They thought it is still the same as last year. Hi there. Nice to find your blog with running event photos. I also participate in running events too. Feel free to visit my blog.